The Project Management Office (PMO) is a group within an organization that defines and maintains standards for project management. It is the source of documentation, guidance and metrics on the practice of project management. The ESI survey was conducted online from March to April 2015 and attracted over 900 respondents from five continents and from sectors such as energy, telecommunications, engineering, financial services and IT. Among the respondents of the survey, around 40% reported that their organization use the Agile approach on some of their projects while 54% use some type of Agile consulting to help them adopt Agile approaches. Scrum (79%) and Kanban (37%) are the most popular Agile frameworks used for project management. A majority of the participants acknowledged that the use of Agile has increased recently either in the number or %age of projects. Of those that do not use Agile, 20% explained that it was because they did not understand how to apply it. A majority (54%) said they have no practical experience with Agile. 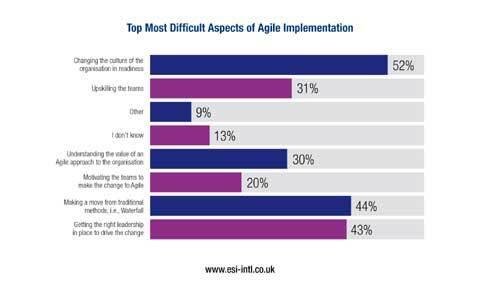 Among those who use Agile for internal or a mix of internal and external projects, 19% explained that because it is a cultural change too big for their organization was the primary reason why the organization is not using Agile more often. The most difficult aspects of Agile adoption are “changing the culture of the organization in readiness” (52 %), “making the move from traditional methods i.e., Waterfall” (44 %), “getting the right leadership in place to drive the change” (43 %) and “upskilling the teams” (31 %). The challenges relating to Agile varied depending on the level of project performance. For respondents with poor project performance levels (delivered less than 25% of the time to budget), 45% think that the cultural change/upskilling teams and a lack of Agile leadership are the biggest challenges to Agile adoption. Those where project performance levels were more positive (delivered to budget more than 75% of the time) classified “understanding the value of Agile” (35%) and moving from the traditional (Waterfall) methods (47%) as the biggest challenges. The interesting part of these findings is that they are provided by people who have mostly a classical (PMP) project management background. They are the typical representatives of the large organizations where Agile is trying to gain traction. The specific context and challenges of these organizations have given the birth to new Agile frameworks like the Scaled Agile Framework (SAFe). The most important point of this survey is that PMO see the lack of skills has the major issue with Agile adoption. Will large organizations be ready to spend money on effective (Agile) training? I am not very optimistic about the answer to this question. The figures and the data of this article are excerpted from the report “The Global State of the PMO 2015 and the Rise of Agile” published by ESI International. Visit http://www.esi-intl.co.uk/pmoexecsummary2015 to read a summary of this report and register to download the full document.